Bruises, rashes, cuts, coughs and cold are part of every kid’s childhood. You probably had your share when you were younger and now your children come home every day with a new cut or bruise. It is natural to feel anxious about your child’s health when he or she gets cold or worry about their safety when they get yet another bruise whilst playing. The large majority of issues like cough, sore throat or slight difficulty in breathing is usually just symptoms of common cold and will eventually get better. Even a lot of cuts that your kid might get while playing are usually harmless. Skin rashes or abrasions are not anything serious as they could just be due to scratches. But that is not to say that kids don’t do dangerous stuff. Sometimes, they may seriously hurt their head or maybe their immune system is unable to fight off a cold virus, leading to prolonged and serious illness. So how do you decide when is the time to rush to the ER is and when is it alright to just use some home remedies to take care of your child? Well, if you observe any of the 10 signs mentioned below, you should not ignore them and get them immediate medical attention. Fever is natural phenomenon that occurs when the body is fighting off infection. If a child has a fever, it means that his immune system is working. You can give your child medications like acetaminophen or ibuprofen to treat fever, but only if they are at least 6 months old. Pediatricians don’t recommend giving these medications unless the temperature crosses 101 F.
Mostly high fever, defined as 104 F, does not warrant a trip to the ER. You can visit the doctor the next day. And if they are eating and drinking normally, you can just counsel your doctor over the phone. In such cases, what kids usually require is sufficient rest. However, if your child has extremely high fever – like this is the sickest he has been- and feels week and unable to move, it is time to get medical attention. If your child is 2 years or older, a doctor is recommended, if he has a fever of 104 degrees F or higher; if he looks unwell, or if he has had a persistent fever for four or more days in a row. A child younger than 2 years should be seen by a doctor within 48 hours of a fever. Headaches in children can be tricky business because young children might be unable to express how bad the pain is and for how long have they had it. Sometimes, children might not even realize they are having a headache. Usually over-the-counter pain medications are effective in dealing with minor headaches. Coupled with a sleep or rest for a few hours, the headache should go away. However, if the headache persists for hours, despite giving medication and rest or if the pain is so intense that the child is unable to get up, play, eat or watch television; get in touch with your doctor. Also, if the pain is causing neurological problems like the child is unable to open their eyes, their vision is blurred, they are confused, the child is having trouble walking or if the headache is accompanied with fever, rush to the emergency room to rule out meningitis or any other neurological issue. Stomachaches are routine for some kids, especially as they work through new diets, try new foods, or have the occasional junk food overload. But if the stomach pain persists over time and gets progressively worse, it can get serious. If your child complains of dull pain centered on the navel, which progresses to a sharp pain in the lower right side of the abdomen, it can be a sign of appendicitis. If your child complains of stomach pains that gets worse and is accompanied by any of the above mentioned symptoms, you should rush to ER. Babies cannot express it if they are not able to hear properly. But by observing their reaction you can evaluate if their hearing is impaired. If you notice that your child isn’t bothered by or doesn’t respond to loud sounds, make an appointment with your pediatrician to check for hearing problems. You should also do your bit to prevent hearing loss in children. According to Centre for Disease Control (CDC) about 12.5 percent of children ages 6 to 19 have permanent hearing damage due to exposure to loud noise. To bring down these numbers, limit the amount of time your children are allowed to spend in front of television, playing video games, doing computer or listening to music, especially via headphones. Ensure that they keep the volume at safe levels and use noise cancelling headphones that rest over your ear. Headphones that rest over your ears instead of inside your ears are considered better for protecting your hearing. The noise-cancelling models have memory foam on the ear cushions so as you wear them, the headphones become more fitted to your head, which reduces ambient noise and shifting. If your child has food poisoning or any other stomach bug, like gastroenteritis, observe how often, and sometimes what, they are vomiting or excreting in loose motions. Vomiting more than 4 times during a single afternoon or 8 bouts of diarrhea can cause mild dehydration. Talk to your doctor for recommended electrolyte solution to replace the loss of fluid in your child’s body. Monitor their dehydration levels as it can sometimes lead to emergency. In case your child is unable to retain any liquid given, he will need prescription medicine and/or some IV fluids to stop the loss. During loose motions, if your child is excreting blood along with the stools or if the diarrhea is accompanied with severe abdominal pain, you should head to the ER. When your child vomits, check to see if the vomit looks like coffee grounds or if it is accompanied with abdominal pain. If any of the above symptoms persist, get medical attention as soon as possible. Children, especially babies and infants, can often suffer from breathing problems. These problems include shortness of breath, wheezing, breathing fast etc. These problems could be due to common causes like nasal or chest congestion, cold, cough or dryness in the air. These can be easily rectified at home and often do not need a visit to the doctor. But on some occasions, breathing issues could be deadly. If you notice that your child’s breathing is getting worse when lies down or they are unable to make a sound due to lack of breathing, then you should take them to the ER. Other signs that indicate that breathing problems are serious include your child’s lips/nails/skin turning blue; continuous severs cough and persistent wheezing sounds. In such situations, it is wise to get immediate medical attention. Children often get rashes on their arms and feet, since they spend so much time playing outside. These rashes could be due to scratches or reactions from virus or allergy. If you touch the red rash and it blanches or turns white, then you let go and it turns red again, you usually don’t have to worry about it. These rashes are generally harmless and appear in one part of the body. However, if you notice rashes that are covering the child’s entire body, you might need to consult with the doctor. If rashes don’t change color and are accompanied by fever, it could indicate a medical emergency. Also, if you notice hives on the skin, accompanied with lip or facial swelling, take your child to the doctor. If he or she also has labored breathing or has difficulty breathing along with the above mentioned symptoms, call emergency services as this could an anaphylactic reaction. It is normal for children to drink glasses of water after they’ve spent the whole the day playing. In fact, it is a positive sign that your child’s body is adequately hydrated. But if you notice that your child is drinking loads of water despite minimal or no physical activity at all, there might be something wrong with them. If your child has insatiable thirst and no amount of drinking water seems to quench it, then you might need to get it checked. Persistent extreme thirst could be a sign of type 1 diabetes. This is usually the case if extreme thirst is also accompanied with increased urination, extreme hunger, weight loss and fatigue. Consult with your doctor and get tests done to check if your child has type 1 diabetes. Different individuals have different levels of healthy urine output but on average, a child aged between 6 – 12 years old should go at least seven or eight times a day. Of course, a lot of factors affect this; your kid’s diet, level of activity, amount of water drunk and their overall body functions. The same way, children also have different levels of energy. And it is absolutely normal to feel tired after playing or laze around on a weekend. But if you notice that your child has been feeling tired for a few days continuously or doesn’t seem to have the energy that they usually do, it might be of concern. It is also true for decreased urination. While it is okay for a day or two, persistently low urination can be a sign of a medical problem. Low urination and chronic fatigue when accompanied with dry skin and lips, dizziness, excessive vomiting and diarrhea is a sign of dehydration. Dehydration means that your child’s body has lost excessive amount of fluid and is unable to function properly. It requires urgent medical attention so you should seek help without a moment’s delay. While stiff neck is a well known sign of meningitis, your child having a stiff neck does not necessarily mean that they have it. It is most often caused by improper positions during sleep. People are not conscious of their body positions while sleeping and may sometimes turn and twist their neck in a way that makes it stiff. Even if a stiff neck is accompanied by fever, it could easily be a sign of tonsil inflammation or swollen nymph lode. Do not immediately jump to meningitis. For meningitis, there are a number of symptoms that occur along with stiff neck; this includes fever, light sensitivity, headaches, vomiting and lethargy. 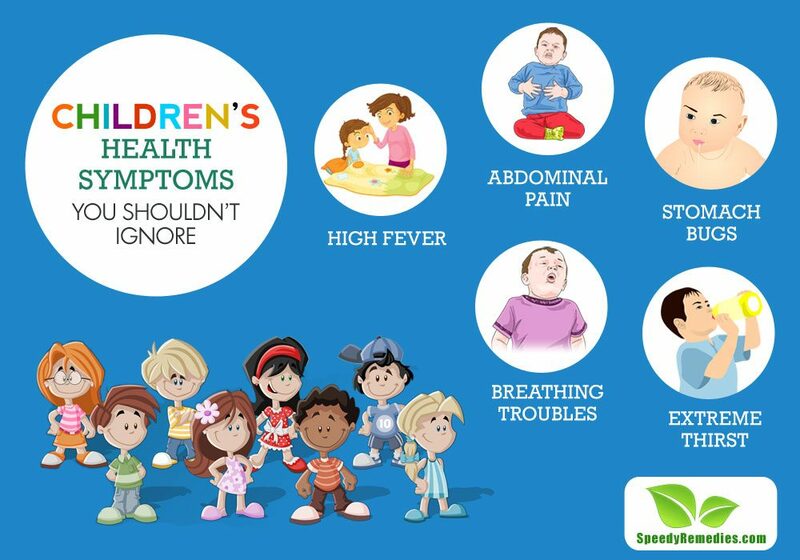 If your child displays two or more symptoms at a time, then you should immediately get medical attention. It is natural for parents to be over – protective of their children and feel anxious about their well being. But a lot times, things are not really that bad. If however, your gut or instinct tells you that something is not right and that your child needs immediate medical attention, always listen to it and rush to the hospital. Often times, parent’s gut instinct about their children are correct and can prevent children from anything serious.